Includes one copy of The Student Leadership Challenge Student Workbook and Personal Leadership Journal, one copy of the Student LPI Self Inventory, and three copies of the Student LPI Observer Inventory. 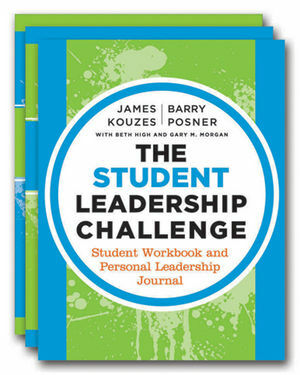 Jim Kouzes and Barry Posner are authors of the award-winning and best-selling book, The Leadership Challenge. Kouzes is Chairman Emeritus of the Tom Peters Company and an Executive Fellow at the Center for Innovation and Entrepreneurship at the Leavey School of Business, Santa Clara University. Posner is Dean of the Leavey School of Business and Professor of Leadership at Santa Clara University (Silicon Valley, California). Kouzes and Posner are also authors of Creditability, Encouraging the Heart, and The Leadership Planner. Their 360-degree leadership assessment instrument, The Leadership Practices Inventory (LPI) and LPI Online (wwwlpionline.com) has helped develop the leadership of nearly 1 million people. Combined, these offering truly make them the most trusted sources on becoming a better leader. Kouzes lives in San Jose, California and Posner lives in Monte Sereno, California.